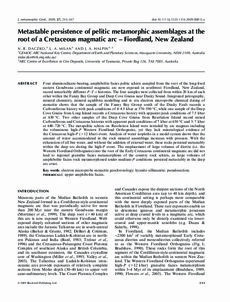 Four aluminosilicate-bearing, amphibolite facies pelitic schists sampled from the root of the long-lived eastern Gondwana continental magmatic arc now exposed in southwest Fiordland, New Zealand, record remarkably different P-T-t histories. The four samples were collected from within 20 km of each other within the Fanny Bay Group and Deep Cove Gneiss near Dusky Sound. Integrated petrography, mineral chemistry, mineral equilibria modelling and in situ electron microprobe chemical dating of monazite shows that the sample of the Fanny Bay Group south of the Dusky Fault records a Carboniferous history with peak conditions of 4-4.5 kbar at 570-590 degrees C, while one sample of the Deep Cove Gneiss from Long Island records a Cretaceous history with apparent peak conditions of 7.5 kbar at 650 degrees C. Two other samples of the Deep Cove Gneiss from Resolution Island record mixed Carboniferous and Cretaceous histories with apparent peak conditions of 7 kbar at 650 degrees C and 3-7 kbar at 640-720 degrees C. The metapelitic schists on Resolution Island were intruded by arc magmas including the voluminous high-P Western Fiordland Orthogneiss, yet they lack mineralogical evidence of the Cretaceous high-P (> 12 kbar) event. Analysis of water isopleths in a model system shows that the amount of water accommodated in the rock mineral assemblage increases with pressure. With the exhaustion of all free water, and without the addition of external water, these rocks persisted metastably within the deep arc during the high-P event. The emplacement of large volumes of diorite (i.e. the Western Fiordland Orthogneiss) into the root of the Early Cretaceous continental magmatic arc did not lead to regional granulite facies metamorphism of the country rock schists, as large volumes of amphibolite facies rock metamorphosed under medium-P conditions persisted metastably in the deep arc crust.